The 'Falcone' is one of the most successful machines Moto Guzzi has ever made. 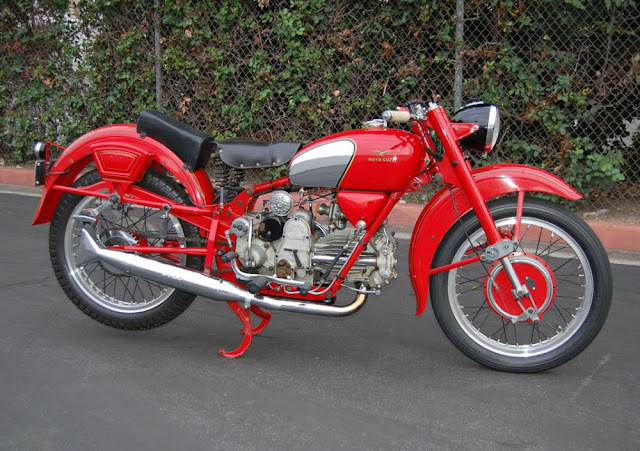 It flew onto the Italian motorcycle scene in 1950. Falcone was fitting, since Moto Guzzi's emblem is a winged eagle. That came about when one of the three founders - Giovanni Ravelli - was killed in a plane crash. His partners adopted the insignia of their air corps, in tribute. The Falcone was from a long line of flat-singles - incorporating everything from luxury tourers, to sparse and spare racers. It provided two riding styles - 'Sport' and 'Touring'. Such versatility kept the Falcone flag flying until '76 - 26 years since its release. It was an icon on Italian roads. With its flat 'bars and rear-set footrests, the Falcone was a sight to see in Sport mode. Its fire-engine red paint was eye-catching! Top whack was nominally 85mph - but a sprinkling of Dondolino engine parts served up an appetising 100mph. And all from way down low in the rev range. The blueprint for the Falcone's 498cc engine had been drawn in 1920 - when Carlo Guzzi designed the first of the motorcycles to bear his name. The 4-stroke motor - with horizontal cylinder - just kept on going, whatever was asked of it. Moto Guzzi has now been around for almost a century ... always stylish, but with a homely feel, to boot. Borne up by its ever-loyal fan base, here is to another 100 years of gorgeous Guzzi! And yet more motorbikes with the finesse of the Falcone.